The Baby Relax Abby Nursery Rocker is a great seating solution for those looking for a contemporary rocker with traditional features. This rocker is the perfect blend of straight lines and traditional 'feels like home' comfort. 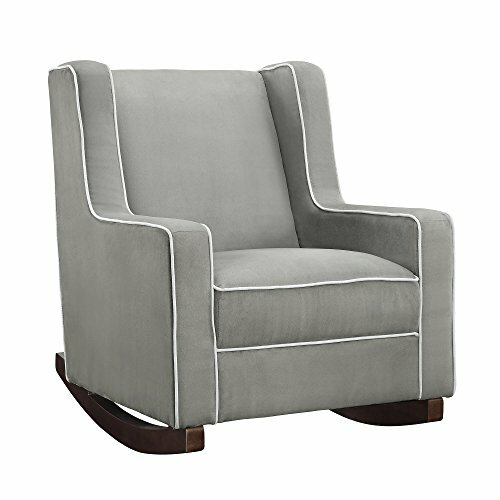 The beautiful square shape is nicely accented by the complementing two-tone welting, giving the rocker a clean crisp look. The upholstery then adds coziness with its soft-to-the-touch microfiber fabric. The Baby Relax Abby Rocker is available in three different fabric color options to suit your decor. The durable construction and the solid wood espresso finished rocker feet will easily ensure years of use. Should you wish to prop your feet, the matching Baby Relax Abby Storage Ottoman is available (sold separately). Get your Baby Relax Abby Rocker today for your nursery room or play room and make this the new favorite spot for story time.